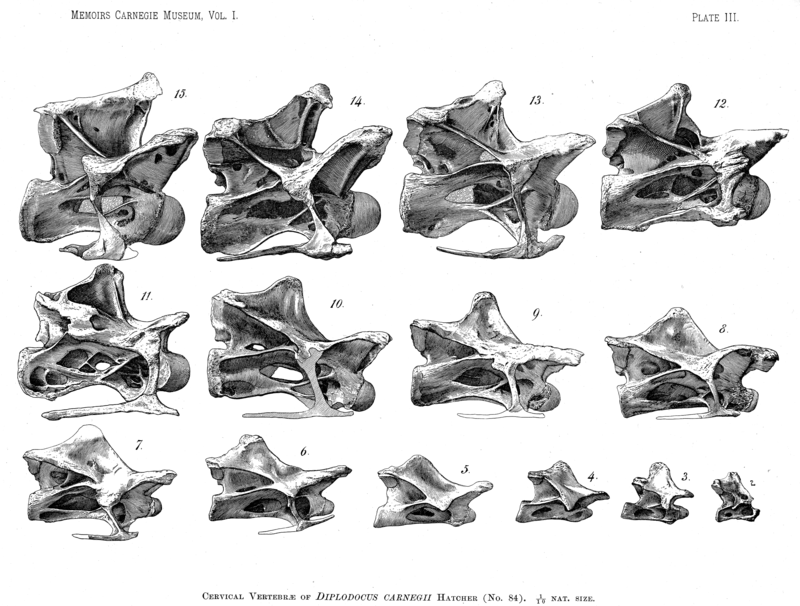 Here are cervical vertebrae 2-15 of Diplodocus carnegii in right lateral view, from Hatcher (1901: plate 3). Click to embiggen, and then just gaze in wonder for a while. Wouldn’t that look smashing, printed, framed, and hanging on the wall? I wonder if I will ever stop finding new interesting things to think about in this image. I doubt it. Thanks to Mike for the scan. Thanks for highlighting that diagram. The ball of the ball and socket is very interesting. How can we believe that the neck was rigid when we see a functional structure for flexibility like that? Do you have any more showing the ball and socket joint? Stephen, the ball-and-socket joints between sauropods vertebrae do look like an adaptation for flexibility; but they have also been interpreted as an adaptation for (you guessed it) stiffness — IIRC, someone argues that the reasons these joints persist right back into the posterior dorsals of titanosaurs is as a stiffening mechanism. I’d be interested to know from people with more comparative anatomy than me what such joints mean in extant animals.